Powerful oblique muscles are essential for stabilization, building strength and power to the body. Are you looking forward to tighter abs? If developing your abs or oblique muscles has always been a priority, you need to include a few specific exercises in your daily routine which will help you out. When you train your oblique muscles, which are situated at the sides of your abdomen and between the hip flexors, you will be able to easily tone these muscles and develop stronger oblique muscles with a great powerful core. To do this workout, you will need one dumbbell in your hand. Stand in a comfortable position as you keep your feet shoulder distance apart. You will again slowly squeeze the glutes and again brace your core, just as if you are going to be punched in gut. You can press the dumbbells just overhead. You need to pause for sometime and then again reverse the movement. You can get back into a start position. You need to repeat at least 8-10 times. This is an excellent exercise for the oblique muscles which helps in developing the muscles and helps in building endurance. To do this workout, lie down in a comfortable position. Your legs will be completely flat and on the floor. Keep your arms comfortable and extended just above the head. Now, you need to slowly lift the leg up and keep your foot just above the hip. Your knee needs to be in a bent position. Your left leg shall be completely engaged when you are in such a position and for the whole movement. You need to slowly allow your chin to tuck in and move it towards the chest. You can reach to the right arm and move it close to your left foot. You need to contract the core and hold on this position for a few seconds. Get back to the start position as you keep your foot and your hand up above the ground. You need to repeat at least 4 times before you can switch towards the right leg and your left arm. You need to do at least 3-4 sets. You can repeat 5 times on each side. Rest in between these sets. Start the workout by sitting down comfortably on the floor. Keep your knees bent. You will need to hold on to a weight plate which shall be right in front of the chest. You need to slowly lean a bit back, so that your body makes a 45 degree angle to floor. You will be bracing your core just as you are about to get punched in gut. You will not move your body but slowly move your arms towards the left as much as you can. You need to stop for a few seconds before you do the same on your right side. This is an effective workout which helps in targeting the specific oblique muscles, abs and chest muscles. These are effective in improving circulation and cushioning the muscles for better circulation. You will hold a dumbbell in your hand. Lie down with your face up on the floor. Keep your knees bent as they make a 90 degree angle. Your shin will be totally parallel to the floor. Keep your arms by your sides and they should be a bit bent with your palms up. 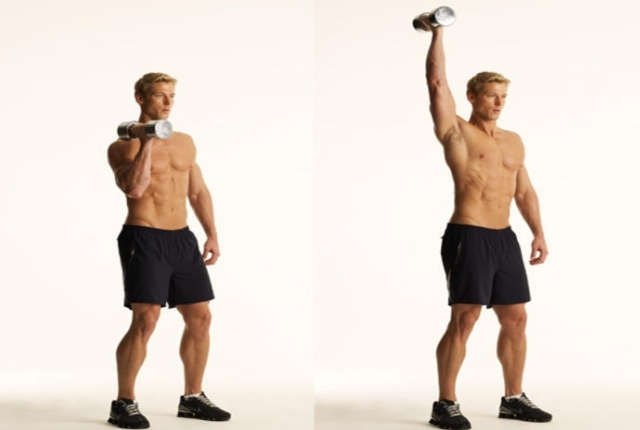 As you keep your arms a bit bent, you can raise the dumbbells so that you can touch them above the chest. Lift your head and shoulders above the ground. You will reach on to the dumbbells by the right hip. You can get back to the center and again lower your body to the start position. You can repeat the workot towards the left side. You need to do all the repetitions as you alternate the sides. Do this workout at least two times in a week. This is a common exercise which helps in building the oblique muscles and strengthens them as well. Start by lying down on your side. Your legs shall be straight. You will slowly prop up the upper body comfortably on the forearm. You need to raise the hips. This will make your body help in forming a completely straight line from the head to heels. If you wish to make the workout a bit challenging, you can elevate the feet. You can also add a few torso rotation moves too. This exercise should be included at least four times in your weekly workout plan.